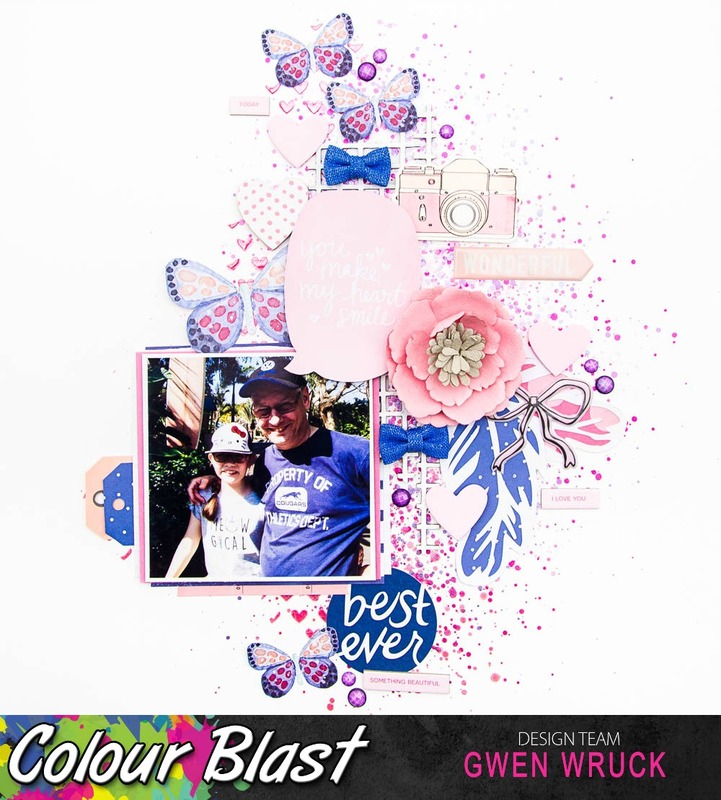 I’m back on the blog today with my latest layout. This one features my hubby and daughter on a recent trip to Sea World. It’s really just a happy snap so for this page, I really just wanted to document their sweet relationship in a fun and cute way. 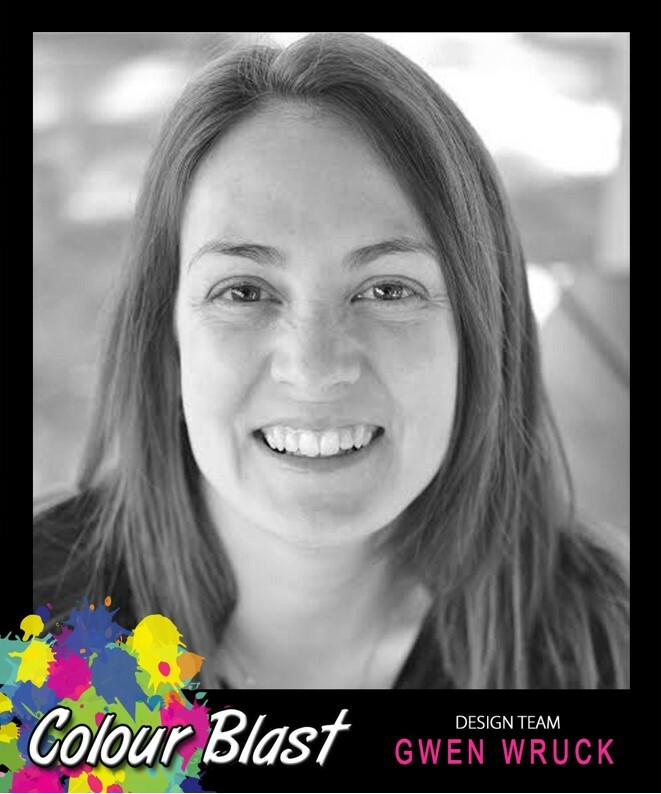 As usual, I started my page by choosing the colours I wanted to use with my photo. I’ve gone with Blush, Lipstick and Punch. 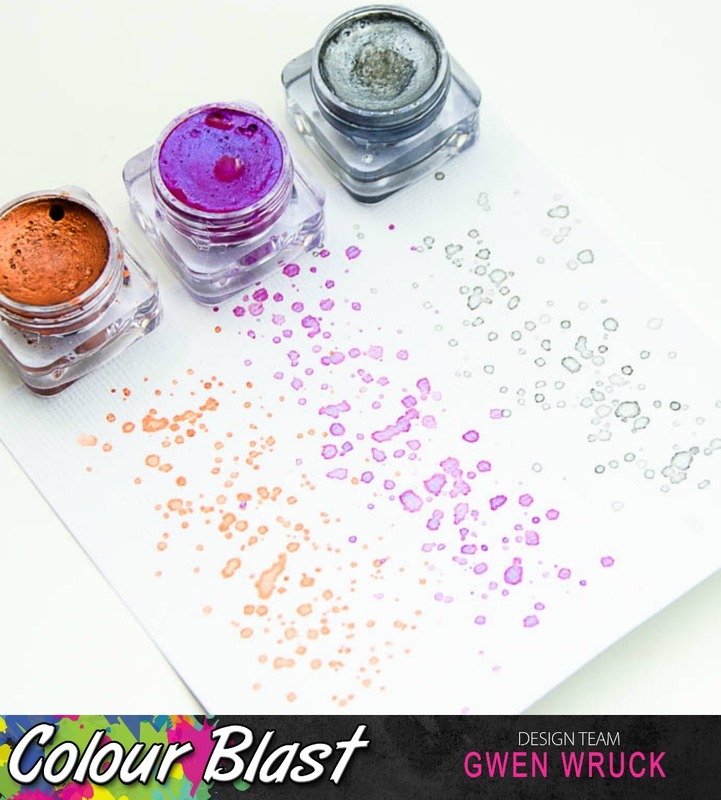 Again, I’ve used the Colour blast Shimmer Cubes because I just love how clean they are to work with, no mess, no fuss, just pretty shimmery colour!! 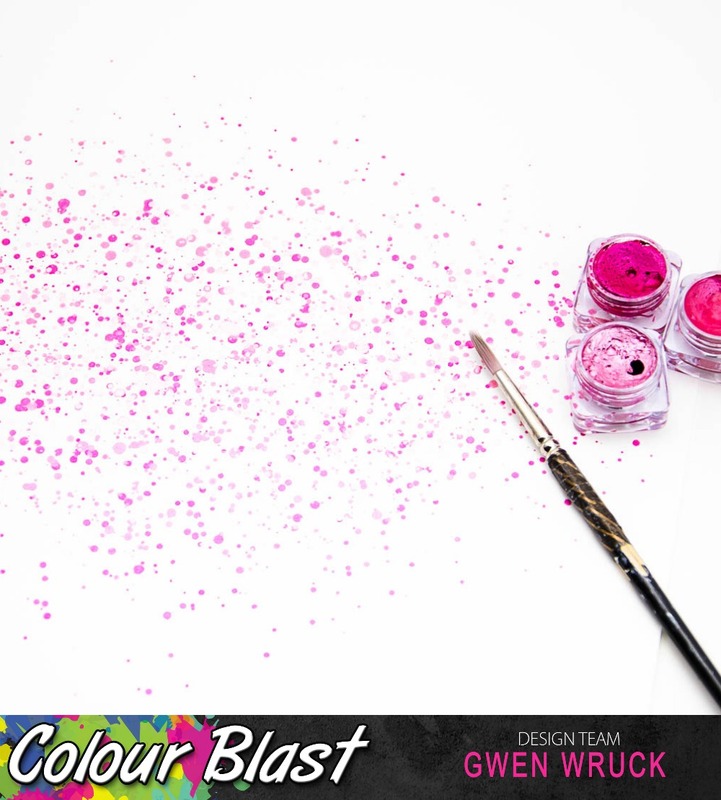 I began by creating splatters down the centre right side of my page. I knew I wanted to add a highlight colour but at this stage, I wasn’t sure which to choose, so I swatched a few on a scrap piece of white cardstock. From this swatch, I was able to hold this against the background I had already created and my photo and compare how they would all look. 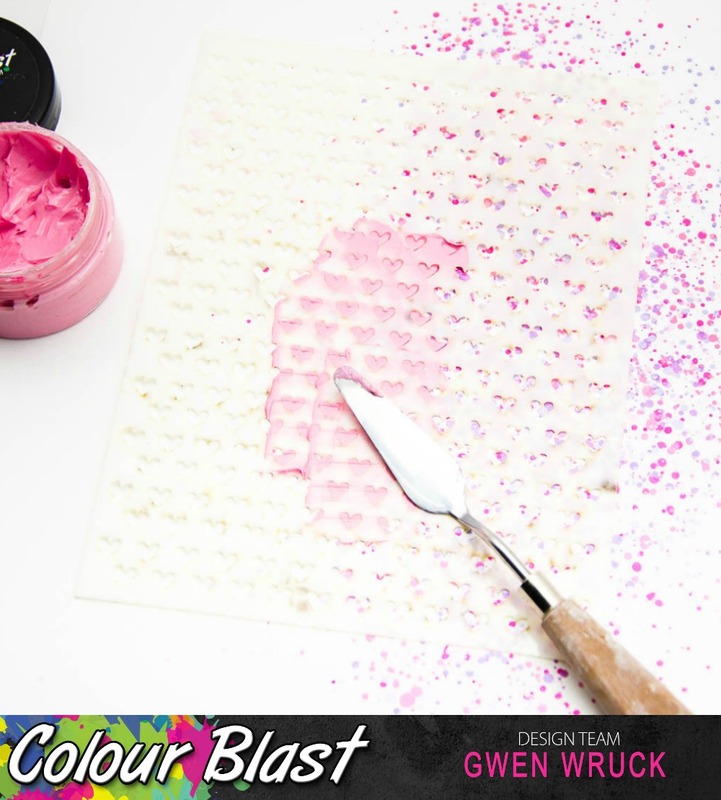 I simply added the two new colours in splatters in the same way until I was happy with the coverage. I have mentioned previously but I will add it again, if you are after a clean look, you have to wait until all the splatters are dry before adding the next layer. If you don’t, the colours will blend into each other. It took a while to build up so many splatters but I love how it turned out. 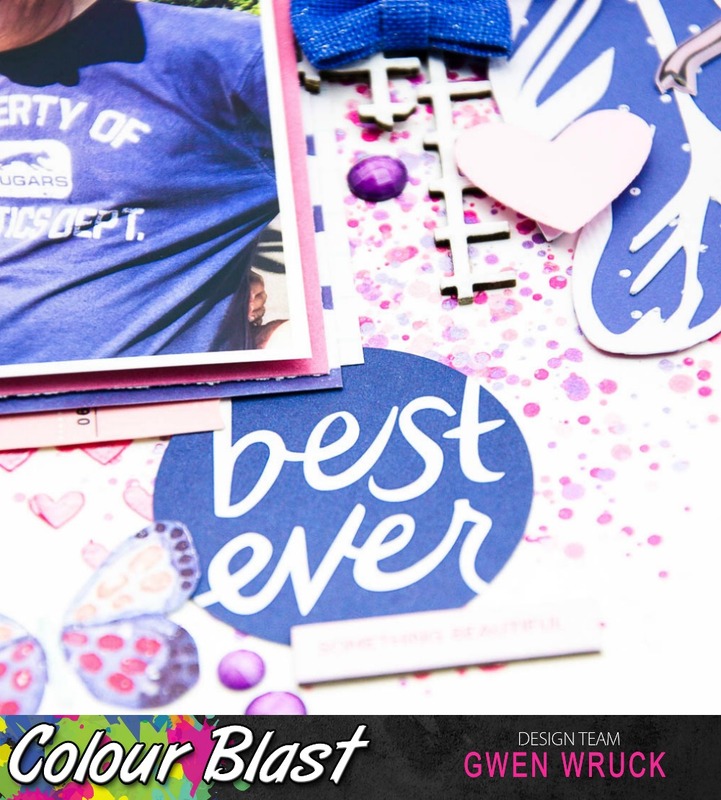 Next, I really wanted to give the Colour Blast Colour Paste a go, and NOPE, I have not worked with it yet! When trying new things, I always find it best to work with a colour you know you love, so I went with Blush. This way, I knew if I didn’t like it, it would be the product and not because I wasn’t sure about the colour. I have to admit, Blush really is my favourite, but Bling comes a very close second! Yes, as you can see by the photo evidence above, I did get a little messy! It wasn’t that bad, I just used my palette knife to scrape the Colour Paste across the stencil – a little goes a long way. I wanted to overlap some of the splatters with the focus down the left side of the page. The paste washes up really well so your stencil stays nice and clean. I will add here, that I find stencils like this one that has a very clean pattern that is orderly really helps keep your design clean, even though you are using mixed media. So be on the lookout for geometric stencils that are uniform in the pattern if you prefer this style. Now that the background was complete, it was time to add my photos and other embellishments. 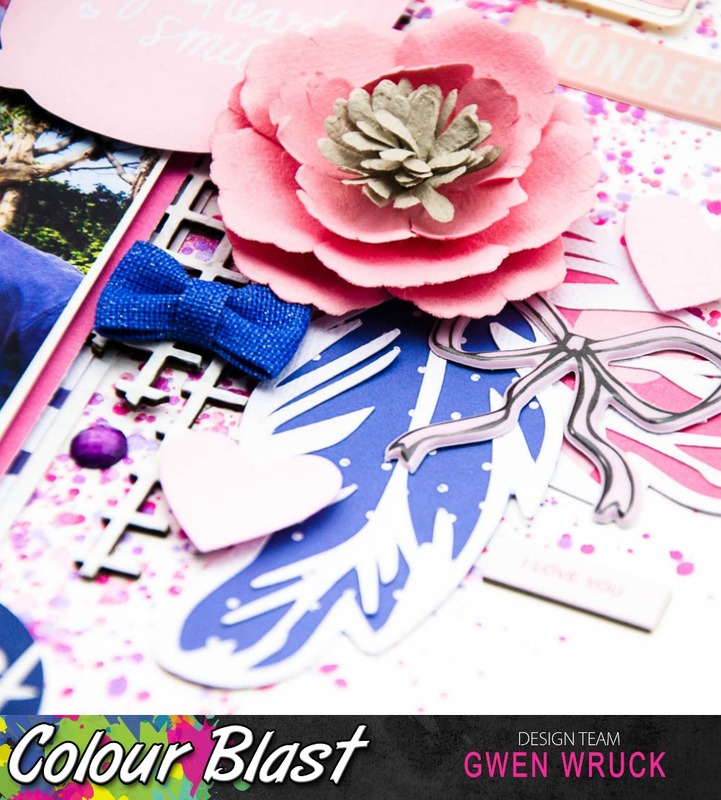 I worked with the photo first adding photo mats and then these cute die cut feathers. For the chipboard, I didn’t really want to colour it but had to cover the grey/brown colour so I went straight to the Gesso. I love this because it is heavy gesso, so nice and thick and the coverage is so good, this was just one thick coat. I love how I can add the texture of the chipboard but it also blends into my background for a soft look. Once the photo and feather elements were in place, I had a dig through my stash of things that would suit the colours on my page. When I found this cute speech bubble, I knew it was the perfect addition and would end up being the “title” of my page. I also found sweet butterflies to cut out and add, that were the perfect blend of the purple and navy I had going on. Here you can see the pretty paint splatters showing through all of the embellishment clusters. I really love the softness they add to the page, it’s like they ground the embellishments and give them a guide to how they will flow up and down the page design. 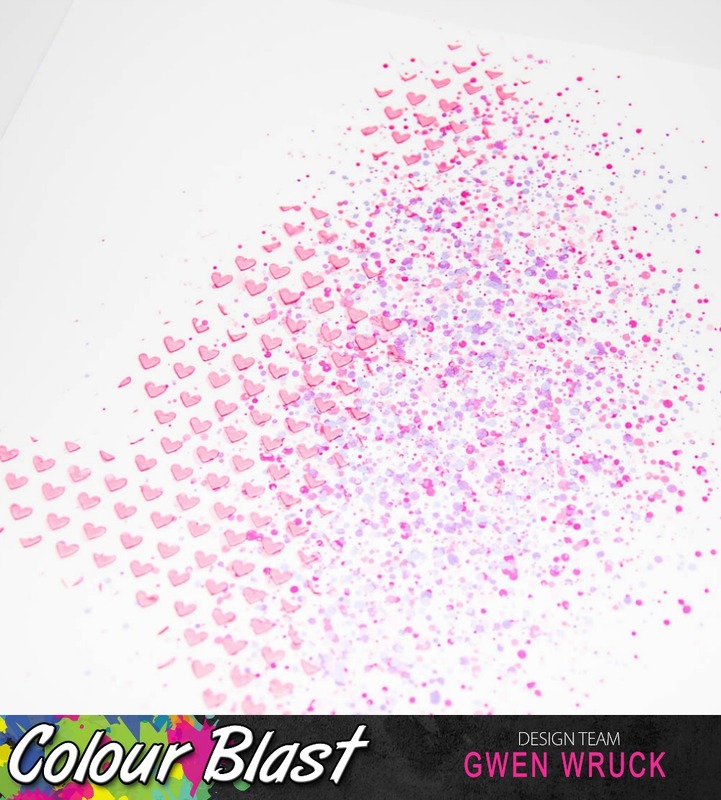 Lucky last, another close up of the splatters on the right and the sweethearts from the Colour Paste on the left. I am really happy with how these two products have come together on the page. 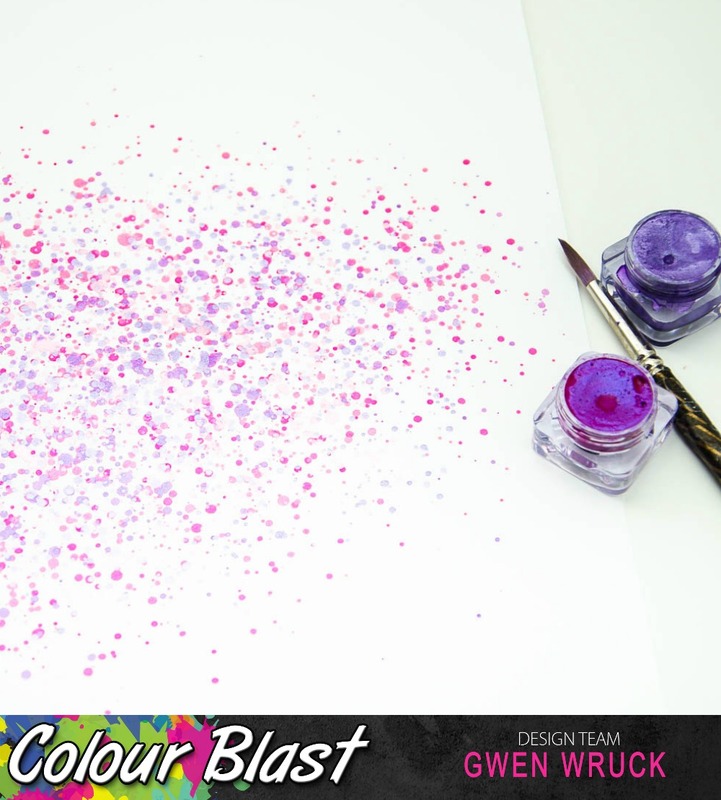 The Colour Paste has this wonderful dimension to it and a translucency when dry that is really cool. I give this project a “mess level” of High, but worth it. 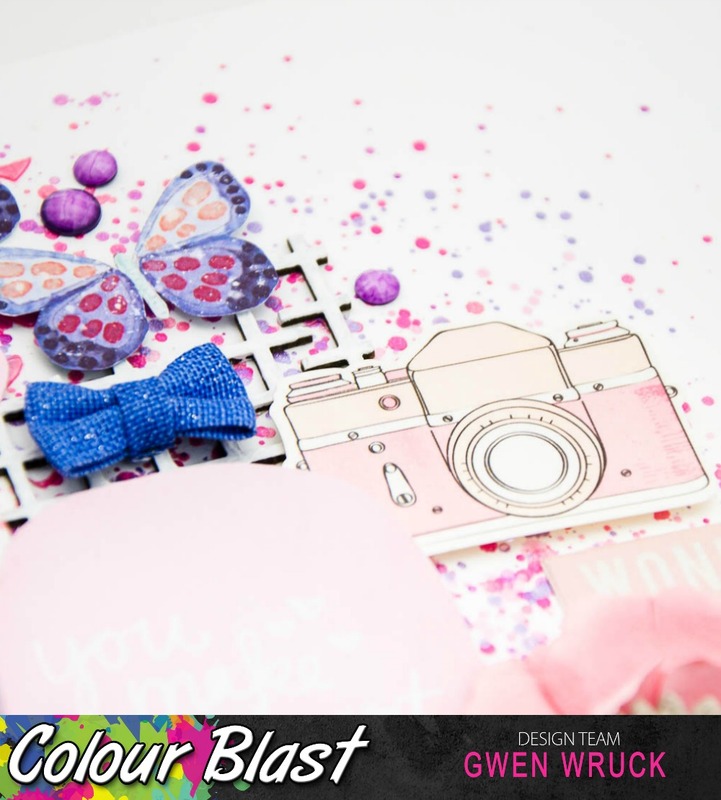 Thanks for popping by today, I hope this page inspires you to get yourself some Colour Paste, clean scrapper or not, you need this in your stash.